This fall, a brother spent a week in Belarus, to visit the Christian communities and meet the young people preparing to participate in the Riga meeting at the end of the year. "It was important to visit once again the Orthodox and Catholics of Minsk. At the parish ‘Joy of All the Afflicted’ I participated in the Orthodox liturgy on Sunday morning, the first morning of our stay, and then we met with priests and young Orthodox who are preparing to come to Riga. 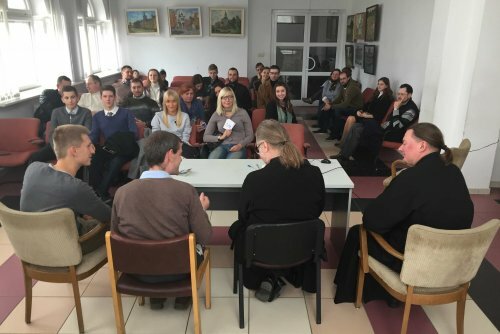 The next day I was able to exchange for an hour and a half with students of the Institute of Orthodox Theology of Minsk. Their questions about Taizé, Brother Roger’s life and the quest for unity were very profound. I was pleased to be able to visit Archbishop Tadeusz Kondruciewicz, Primate of the Catholic Church in Belarus, and the newly appointed apostolic nuncio, Monsignor Gabor Pinter, in Minsk. At the Latvian Embassy in Minsk, we were able to talk about the important question of visas for young Belarusians preparing to participate in the next European meeting. Finally, a beautiful initiative I am glad to report: two young people from Ukraine made the trip from Kiev to Minsk to participate in these meetings. In turn, two young people from Minsk visited them in Kiev two weeks later on the occasion of the brothers’ visit to Ukraine. From the town of Gomel, the second town of the country, some monks have come to Taizé in recent years; One of them shared the life of the community for a month, a few years ago. A very full program had been planned, including a beautiful meeting in the main library organized by one of these monks, Father Savva, who also runs a weekly tv program on faith and spirituality. There, as elsewhere, I experienced the hospitality that many young people receive during the stages of the pilgrimage of trust on earth. So I was able to stay in a family of Gomel whose son had come to Taizé a previous summer. It was a beautiful moment of shared life and joy. The stay in Grodno was short, only a few hours this time, but I was very happy to visit the synagogue of the city and to meet representatives of the Jewish community who are dedicated to keeping alive the memory of the tragedies of which they have been victims during the last century. In the evening, in the Catholic Church of St. Bridget, many young people gathered for a prayer and a meeting during which the film about the meeting in Riga was shown, provoking reactions and questions. It was my first visit to this town, which is in the far north of the country, a few kilometers from the border with Latvia. Indeed, the bus from Minsk that dropped me off at Braslau continued on to Riga, a kind of announcement of the coming meeting. Young Catholics from the whole region had been invited to a time of prayer and a meeting, followed by a fraternal meal around a large table. Some had come 100 kilometers to participate in the evening, which was, of course, very touching. Among them, many are also preparing to come to Riga at the end of the year: it is surely the first time that such a large international meeting of young Christians is taking place so close to home. On the way to the next stage of my trip, in Ukraine, I stopped for a few hours in Baranovichi, in the south of the country. I was able to participate in vespers on Saturday evening in an Orthodox church. Then I again experienced the beautiful Belarusian hospitality by sharing the evening meal. That same morning, this visit was not yet scheduled. I often experience that it is sometimes useless to over-plan, to anticipate, when there are unexpected and spontaneous encounters that are organized at the last moment and which are real moments of joy. Everywhere the welcome of the Christians of Belarus was very warm. And many say how much the pilgrimage of trust encourages them in their own journey of faith."